There are a ton of theories about fitness out there. How to best exercise. How to get ripped. How to get the best health. And on and on and on. And your doctor will tell you get more exercise – pretty much guaranteed, but the doc is not going to tell you much more than that to be honest. Because they just don’t know. They are trained to cut and prescribe and most other things just don’t get noticed. But two new studies just came out in that have an eye-opening way of thinking about fitness that may change the way you do just about everything you do in regards to staying and keeping fit. It’s pretty exciting really, because it makes real vibrant health kind of fitness actually easy, and gives you a rather sneaky motivation for staying fit in this super easy way. I believe that it’s important to have the full picture of why or why not to do something. Sometimes this is called a carrot and stick approach. The ugly: Sitting on your rear is a great way to get all sorts of health-wrecking disease. It’s well known that sitting around all day is bad for your health. But just how bad? Take a look. The pandemic of physical inactivity is associated with a range of chronic diseases and early deaths. So chronic disease and early death? That does not sound like a recipe for a good life. The kind of life that makes you want to get up every day. And the types of chronic diseases that come from inactivity are really the scary kind. But it doesn’t have to be that way. And you don’t have to become a ripped demi-god to escape this particular fate. There are actually a bunch of good ways to avoid these really dire health consequences. And a really surprising motivation to do so. 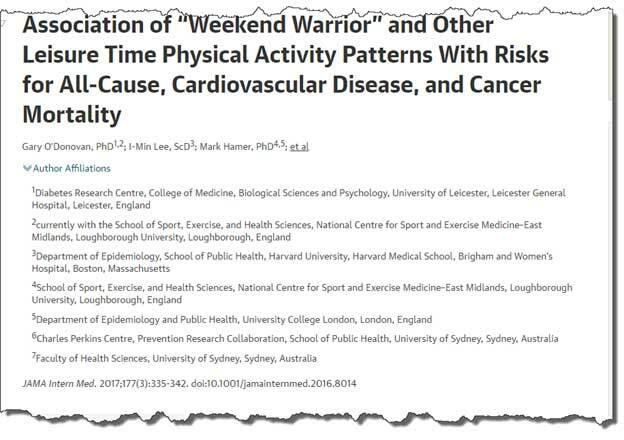 In this study, they looked at so called “weekend warriors”. People like me, who like to get out on the weekends and hike for two or three or four hours at a shot. Any physical activity actually works. Kayaking, golf (better if you walk), basketball, even that crazy sport called pickleball. Getting active on the weekends nearly wipes out the negative effects of sitting all week. Which is a great benefit. Especially if you want to keep your heart and other circulatory systems (you know the male ones that are really important) healthy. Men all over the world are getting in the best shape of their lives the EASY way. Click here to find out more. Those who worked out once or twice a week had a 30 percent lower mortality rate (during the study period, from 1994 to 2012) than those who didn’t exercise at all. But there is a way that gets even better results. Longer, slower exercise gets the best results. The greatest rewards came to those who exercised three or more times a week. These individuals tended to go longer and slower than less-frequent exercisers but logged impressive weekly totals of about 450 minutes. They had a 35 percent lower all-cause mortality rate. I’m not saying to quit any weekend warrior stuff. It’s fun and hugely beneficial. But take a look at this. People who exercised an average of 60 to 65 minutes a day at a slower pace actually get more health benefits than people who exercise hard. So that means that getting a standing desk, pacing when you’re on conference calls or just going for an evening walk with your sweetheart or dog are enough to keep you in optimal health. 60 minutes a day – low and slow. You don’t have to join a gym. You don’t have to do Cross-Fit. Just 60 minutes a day at an easy pace defeats all kinds of disease according to this study. And if that isn’t motivation enough, here’s a surprise incentive. On average someone who met the exercise guidelines paid $2500 less in annual health care expenses related to heart disease than someone who did not. I’ll take that money and lose all the health complications it would be spent on. How about you? Look. If you are tired of the pressure of the big, bad fitness programs, but are scared to death of getting sick and staying sick, the evidence shows that you don’t need to hit the gym or do strenuous exercise. You just need to get activity into your daily life. 60 minutes low and slow (and pacing on conference calls counts). Plus it will save you money. Double win!